J.M. Barrie bowling for the ‘Allahakbarries’. The author bowled out General Haig Authors vs Artists. Sir Arthur Conan Doyle can be seen on the back row 6th from the left. J.M. 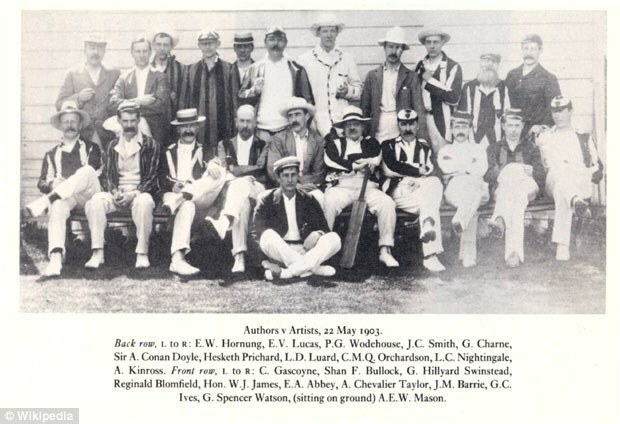 Barrie, author of Peter Pan decided to form an amateur cricket team, and recruited many of his famous friends to join him, including Arthur Conan Doyle! For whatever reason-perhaps because writing can be a rather solitary venture-literary types have long gathered together in search of other pursuits. A modern example is Stephen King’s band, The Rock Bottom Remainders. Members of the band have ebbed and flowed over the years, but the lineup has at various times included Amy Tan, Mitch Albom, Dave Barry, Ridley Pearson, Matt Groening, James McBride, and Scott Turow. But in the late 1880s, writers couldn’t exactly pick up an electric guitar to blow off some steam. Instead, J.M. Barrie, author of Peter Pan decided to form an amateur cricket team, and recruited many of his famous friends to join him. As you might expect, the athletic performance of such an eclectic group of creatives was a bit of a mixed bag. 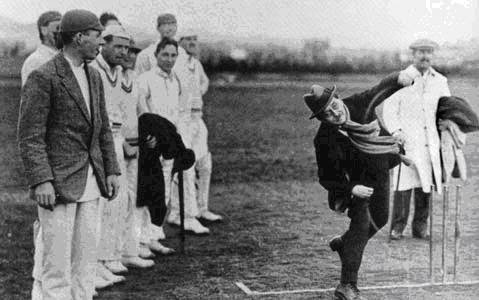 While some members of the team, including Arthur Conan Doyle, were quite proficient at cricket, others were not so athletically inclined. One showed up in pajamas, and Barrie discovered that another didn’t know which side of the bat to hit with. Credit to Stacy Conradt, Mental Floss. Source.